TennisFlex is the official choice of world No. 8, Janko Tipsarevic for modern tennis training and pre-match warm-ups! 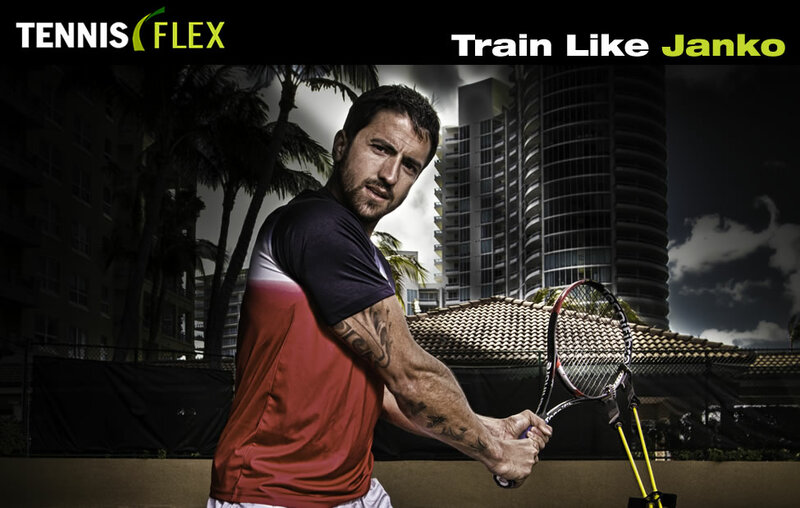 TennisFlex Pro is the first racquet integrated tennis-specific resistance training and conditioning exercise device. Originally created by a team of Tennis pros and sports doctors to meet the rehabilitation needs of tennis player’s injuries for physical therapists; TennisFlex provides a unique mix of tennis-specific swing & rotational resistance, core stability, and coordination training. Its innovative integration of the tennis racquet and resistance cord system creates a variable, asymmetric load, ideal for training balance, explosive power, or pre-match warm ups. If you are an avid tennis player, you probably know that tennis clinics & top pros around the world, have been using resistance bands to train, condition & recover from injuries for years! What TennisFlex has done, is that it has taken this proven tennis fitness method to the next optimum level, by actually integrating the Tennis racquet itself in the resistance training exercises, giving you a more real feel and precise use of tennis-specific muscles. With TennisFlex, since you are actually using the racquet you will be mirroring the real swing path, thereby getting a more precise training and conditioning of Tennis-Specific muscle in each swing. With every swing you will feel all specific muscles in the kinetic chain getting a workout. This patent pending, professional-grade resistance system is designed specifically for tennis players of any level. TennisFlex Pro uses the highest quality components for ultimate elasticity and durability. The unique D-shaped carbon-fiber-reinforced plastic (CFRP) body with spring-loaded gates makes it easy to attach to any standard tennis racket, the CFRP body protecting the racket frame and strings. Our TennisFlex Pro also allows users to continue to challenge their bodies as they become stronger by simply increasing the distance from the anchored base clamp bands or gripping the racket further down the stem. TennisFlex Pro is the ideal tennis conditioning tool you can use anywhere for safe and effective training. Clearly helped strengthen my arm and thus my tennis game. I have been using Tennis Flex Pro for about six weeks at home, with an old racket dedicated to the exercises. For the previous 8 months, I had tennis elbow serious enough to wince in pain a few times per couple of hours of tennis. After using Tennis Flex Pro, while continuing to play, my wincing is down to less than once per session, less severe when it does happen, and I'm swinging harder than I was before! I plan to continue my Tennis Flex Pro exercises and am looking forward to a fully recovered elbow soon. But even after my elbow is 100%, I expect to continue the exercises for as long as I can, because they clearly help strengthen my arm and thus my tennis game. I've been training for 2 weeks! at first it took me a few times to get the hang of it, ( they key is to do it in slowly as if each swing is in slow motion) but i really started feeling the workout in my arm & core muscles. Tennisflex is clave tenerlo en la constante lucha contra el codo de tenista (Epicondilitis). A mi me ayudo enormemente. Cuando empece a usar el TennisFlex senti un a disminución substantiva del dolor en menos de 3 semanas . TennisFlex esta ahora siempre en mi bolso y es parte de mi rutina antes de jugar. OMG!!! What a difference a month of training has made! Tennisflex has vastly improved my entire body strength and has made me realize the importance of strengthening my core, I really hit with more power and feel solid and confident on the court! Tennisflex has taken my functional strength, core stability, and overall muscle health to a new level! I hit with more power, & more balance! I feel like R. Fed!! Coach David introduced me to TennisFlex as I was having problems with tennis elbow for months. I tried many things to cure it...rest, ice, wraps, Band-It, massage, weight exercises, stretching, etc., but nothing worked. When I first got the TennisFlex, I used it every day for about five days before getting back on the courts. I was pleasantly surprised that I felt no pain the next time I played...and I am very happy to say that I no longer have tennis elbow. The TennisFlex device has since replaced other aids in my tennis bag. Now, I look forward to using it more to improve my strokes. Bottom line, Tennis-specific resistance training works! Excellent alternative to the gym! I am a skeptic by nature but decided why not? Having owned TennisFlex for the better part of 2 months I have been able to achieve great results on the court. After using it I found that I was excercizing muscles that I never could with the weight bench! Don't get me wrong the weight bench has it's place. but you cannot recreate the exact swing path of tennis on any gym machine or bench!.